As my friend Joselyn so eloquently and amusingly expressed earlier this week, this screenwriting business is hard work. I am, once again, in the doldrums of Act Two. Whenever I get to Act Two, I suffer that common delusion that the time I’ve allotted to write is the perfect and absolutely necessary time to do laundry, clean the kitchen, bake, go to the grocery store, play with my dogs, or “do research” for various other projects. I am pleased to report that all of my clothes are now clean except for what I’m currently wearing. Tonight I made my plea to Act Two on twitter, and Act Two seems to have listened — at least for tonight. I got a perfectly acceptable seven pages done. My goal is to have this baby finished by the end of July at the very latest. It’s completely doable. And it’s necessary. I’ve got too many unpolished specs lying in wait and too many new ideas bouncing around in my brain. Averaging three pages a day is not too much to ask of myself, even during my busiest weeks. And the truth is, if being a screenwriter is a priority in my life, then I need to treat it as such. 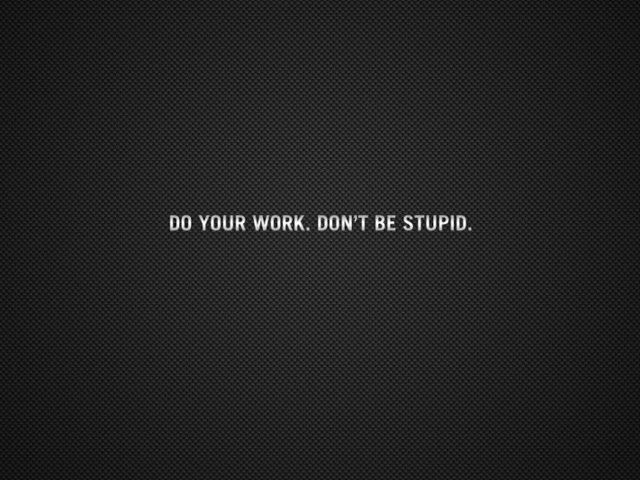 In short, “Do your work. Don’t be stupid.” Besides, with my laundry done and my kitchen clean, Act Two is running out of battle tactics with which to distract me.